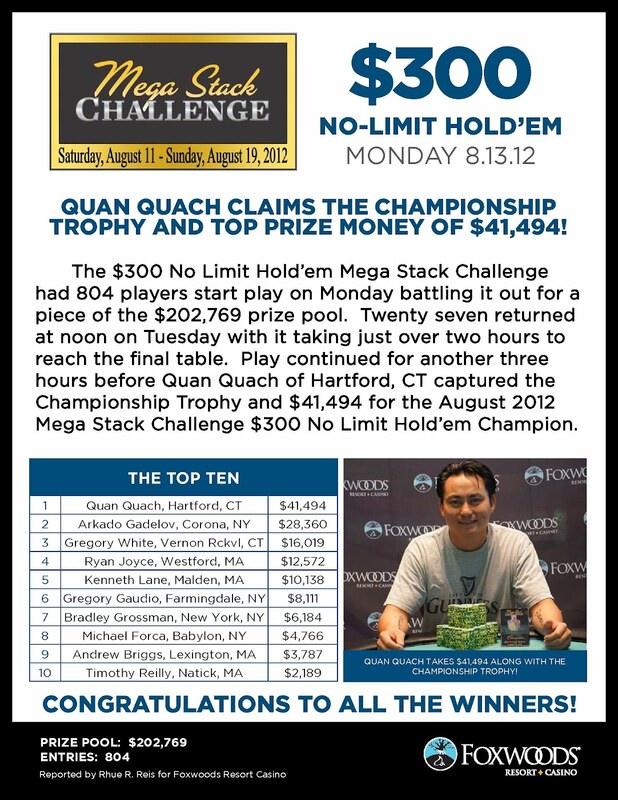 Quan Quach is officially the champion of the $300 Mega Stack Challenge event. He takes home $41,494 and the Mega Stack Trophy. His brother, Phi Quach, passed away on June 8th. Quan said "This is for you brother. I love you and I miss you very much." Once heads-up play started, Arkado Gadelov and Quan Quach came to an agreement on a deal, with Gadelov taking an additional $2,000 on top of second place money. Gadelov officially finishes in second place and takes home $28,360. Gregory White gets all-in with [Ad][3d] but runs into the [Ah][As] of chip leader Quan Quach. The board of [Qc][9d][5c][5s][9h] does not help White and he is eliminated in 3rd place for $16,019. Joyce is ahead until the board runs out [9c][4s][2d][3h][2h]. Quach hits a pair of fours to win the pot and eliminate Joyce in 4th place for $12,572. The board runs out [Kc][Jc][4h][2s][9c] and Quach takes the pot, eliminating Lane in 5th place for $10,138. The blinds will be going to 80,000-160,000 with a 20,000 ante. The flop comes [Kh][9d][6c] and Gaudio takes the lead with a pair of kings. The turn is the [3d] but the river falls the [2s], giving Lane a set and the pot. Gaudio is eliminated in 6th place for $8,111. The board runs out [Qc][9d][5s][6h][9h] and Gadelov pairs his queen to win the pot, eliminating Grossman in 7th place for $6,184. The turn is the [Ks] and the river comes the [9s]. Forca misses his flush and is eliminated in 8th place for $4,766. The board runs out [Qc][Qs][2s][6h][8s] and Briggs is eliminated in 9th place for $3,787. 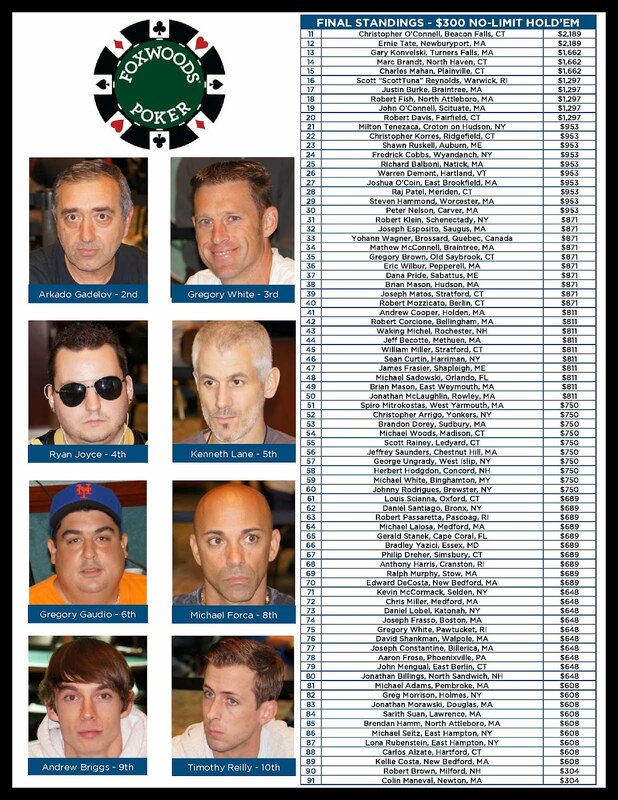 The board runs out [Jc][5s][2c][5h][9c] and Gaudio improves to a full house to win the pot, eliminating Reilly in 10th place for $2,189. We have reached the final table of ten in the $300 Mega Stack Challenge. We had a total of 150 players in the $500 Six-Max No-Limit Hold 'em Mega Stack event. 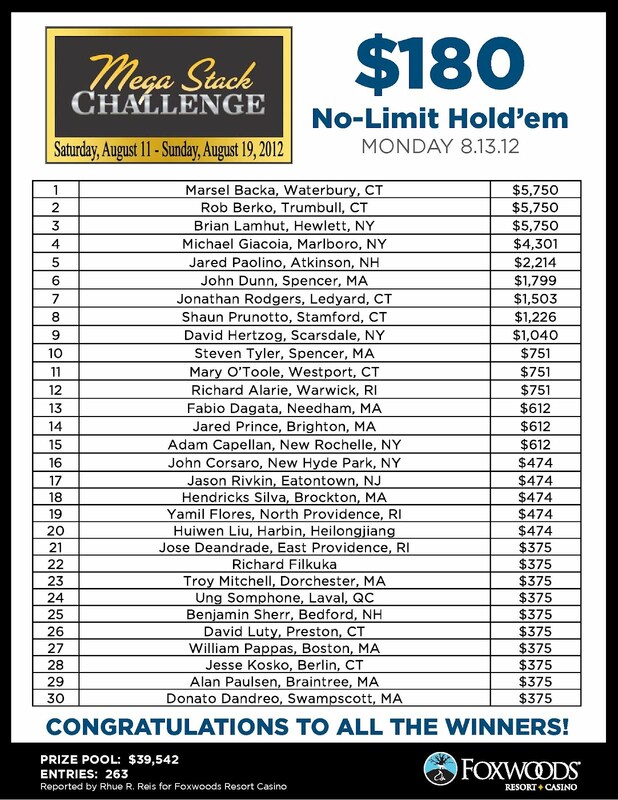 With only 19 players remaining in the $300 Mega Stack Challenge, Ryan Joyce has taken the chip leader with over 1,600,000. Players are currently on a color up break. When play resumes, the blinds will be increased to 15,000-30,000 with a 5,000 ante. The average chip stack is now just over 600,000. 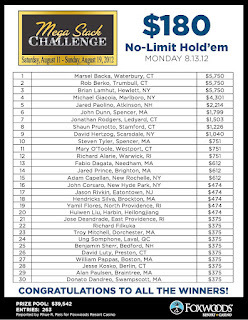 Day Two of the $300 Mega Stack Challenge is now underway. 27 players remain from 804 that started play yesterday.